The 101st Indianapolis 500 should prove to be one for the ages, with its reputation as a landmark race only reinforced this year. Part three is my final roundup previewing the upcoming Indianapolis 500, one of the centre piece events in motorsport. Feel free to visit my other preview pages on my blog, with this entry previewing the final thirteen entries on the grid. The race will undoubtedly provide plenty of action and drama throughout the 500 miles of racing, so let’s take a look at the final batch of contenders. The #25 entry is a very special one, as it’s being run in honour of the popular Brit Justin Wilson, who was tragically killed last August by debris at Pocono. This is why his brother Stefan is making his Indy 500 debut this year, with the KVSH racing team. Whilst Stefan is a rookie and his on track performance is of course important, unlike any other car on the grid this one has another purpose. To raise money for charities linked with Justin. Whilst it’s fitting that it’s his brother who keeps the Wilson name on the Indycar grid this year, it will be tough to produce any headlines on track. He has only competed in one other Indycar race, making this his first Indy 500 and first Indycar event since 2013. He’s qualified 30th and will find it tough to make up places, despite a strong KVSH team behind him. To claim a top twenty spot would be a result for Stefan, although the wider goal of money raised will be irrespective from his on track performance. Carlos Munoz is a young Colombian who is making a name for himself in Indycar as a very solid young driver. He started the season off well with eighth, but since then a string of finishes outside the top ten have hampered his progress. Andretti Autosport and Honda appear to be hooked up here in Indianapolis, with three of the Andretti entries in the top five of qualifying. Munoz was the third of the entries in fifth, a great starting position for the race. Although he will have to race hard to remain in the top five, Munoz has put himself in a perfect position to claim a great result this Sunday. The most famous name in the race is likely to be considered Marco Andretti. The latest in the Andretti has shared his father and grandfather’s bad luck at the Brickyard. While similarly talented names have multiple wins, Marco has yet to win the 500. Whilst he seemingly always manages to run well at Indianapolis, he has struggled to convert this into a good result here. So far it’s been a tough start to the season for him, with no top ten finishes and a 14th qualifying spot for the 500. Whilst a big result at the 500 can easily turn a season around, on current form and considering his bad luck here simply a top ten finish would be an improvement for Marco Andretti. Ryan Hunter Reay has been a mainstay both at Andretti Autosport and at the front of the grid in Indycar for the past five years. He has proven his talent with both the Indycar title in 2012 and Indy 500 victory in 2014. This year has plateaued slightly in the last few rounds, something Hunter-Reay will want to rectify in the biggest race of the year. He’s qualified on the outside of the front row in third, showing just how well he can run around here. With his Andretti team seemingly on top of the circuit, Hunter-Reay will surely go into the race as one of the select few of serious contenders. Whilst a good haul of points would be good for Hunter-Reay, based on his practice speed surely anything other than a win will be met with a tinge of disappointment. American sportscar and open wheel racer Townsend Bell returns for another crack at the Indy 500, after switching his full season focus to sportscars several years ago. Bell always seems to perform well at Indianapolis, and this year a one-off deal with Andretti Autosport it a great fit for him. With little running before the event Bell has shown how strong the Andretti team is by placing his car fourth on the grid in qualifying. For a one-off entry, this is a remarkable result and should it be repeated in the race would surely be one of the main talking points. Bell is capable of causing an upset and from fourth on the grid anything is possible for the experienced American. Alex Tagliani is a mainstay of Indycar and the Indy 500, returning with another one-off entry with the A.J Foyt Enterprises team. The experienced Canadian is capable of a good result here, despite spending the majority of the season racing GT’s in Europe. Whilst it’s always difficult to jump into the series for one race, especially the blue riband event, but that’s not been an issue for Tagliani in the past. This year things have been difficult however, with a crash in his qualifying run relegating Tagliani to the back of the grid, having not completed a run. His hopes for the 500 are unknown, but if he’s at this best then a top ten result is still attainable for Tagliani. With the pressure of running a full season off, he can charge from the back without thinking about the championship. For Brit Jack Hawksworth this is his second season with the A.J Foyt team, and so far it’s been a tough season for him. He has yet to record a top ten finish in the first five races, and things have not improved so far at Indy. He qualified on the final row in 31st position, and in the race this is only going to make getting to the front that bit harder for him. He can still salvage a result in such a long race, but he has not made things easy for himself. The Honda engine appears to be running well here, therefore it will be up to Hawksworth and his talent to drag the car into the top ten, of course dependent on if he can keep out of trouble as he rises through the field. Charlie Kimball is one of those drivers who appears to be underrated amongst the Indycar community, and he’s proved himself whilst at Chip Ganassi racing for the past few years. This year has been mixed for Kimball, with a top five in the last round showing what he can do when he get’s the opportunity. It appears here at Indianapolis that the Chip Ganassi team are struggling slightly for pace, with none of their four cars in the top twelve. For a team that won the title last year this is a tough pill to take, and something they will no doubt be working on flat out until the race start on Sunday afternoon. If they can improve the car during the race Kimball has a chance of a top ten result, if not he may struggle to move through the field from his 16th starting spot. The world famous Brabham name returns to the Indianapolis Motor Speedway, with Matthew the third generation of Brabham to race in the 500. It’s an ambitious effort from the rookie, as he is being run by Team Murray, who are also making their step up to Indycar in the biggest race of the year. The team is receiving support from KVSH racing, and this will prove invaluable to their preparations for the race. So far Brabham has settled in well, qualifying a respectable 26th on the grid for his debut race. For his first ever Indycar race simply finishing it would be a good result for Brabham, although with so many unknowns surrounding the team anything is possible for them. British racer Pippa Mann has once again found a one-off entry for the Indy 500, with support from Susan G. Komen and Dale Coyne Racing. She has shown pace in previous Indy Lights and Indycar races, and this is something she will want to show once again this Sunday. So far it’s been a under the radar month, as she’s qualified 25th for the race. This is a respectable effort considering she has had little time to get back up to speed in these cars. For one-off entries it’s always difficult to achieve a good result, although for Pippa if things run smoothly she can easily score a top seven result in the 500, and potentially earning the opportunity to run further races later in the year. Oriol Servia has seemingly emerged as a specialist in the one-off Indianapolis 500 entry. He is a proven talent at this level and his results surely warrant a full season ride in the series, despite his lack of funds. This year he has teamed up with Schmidt Peterson motorsports, as he looks to have a good result in the 500, which could help him earn more races in the series in the future. After running in the season opener, he has acquitted himself with the very different oval aero kit on these spec Dallara chassis, as he qualified a very good tenth on the grid. This puts him in a great position to maintain his place in the top ten come the finish, which would surely be considered a good result by the team considering his entry is a one-off. After several attempts at the Indy 500, American sprint and midget car racer Bryan Clauson is back once again this year with the one car Jonathan Byrd racing team. His two previous attempts at the 500 have not ended well, so this year Clauson will be hoping to improve upon his current best result of 30th in 2012. In qualifying Clauson produced a good result to secure 28th on the grid. In the race he will have plenty of time to improve on 28th, although with a one car team their data is limited, therefore making it difficult to make in race adjustments to the changing track conditions. For Clauson the Indy 500 is part of a plan to take part in 200 races this year, and this is definitely the most high profile. A good result would be a top 15 result, although this may be just out of reach for the team. American Alex Rossi returns to the American racing scene this year, for the first time since his Formula BMW Americas title victory in 2008. After reaching F1 at the tail end of last season, Rossi has chose to move into the Indycar series this year. The promise he showed in F1 has translated into Indycar so far, as he currently is the highest placed rookie in the standings after the first five races. After spending the majority of his career racing in Europe, his adjustment to ovals will prove crucial to how he fares in the centre piece Indy 500. Taking advantage of a strong Andretti Autosport car he’s qualified a very respectable 11th for the 500, and from here he could easily push on and score a top five or top eight finish come the end. Watch out for Rossi as one of the surprises of the race. That not only wraps up part three, but is the finale for my preview of this Sunday’s Indianapolis 500. The race will be one not to miss, and anyone can watch it in the UK on BT Sport I believe. I would like to thank Motorsport.com again for their incredible quality photos which you see in this article, I really urge everyone to visit their site for the latest in motorsport news. I would also like to thank you for reading these previews, and any comments at all would be greatly appreciated. Find me on Twitter @brfcjordan95. This is part two of my preview for this Sunday’s blue riband Indianapolis 500, one of the three triple crown races which carry the most prestige in motorsport. If you missed the first part of my preview, you can view it here. Part 1 preview . For now let’s move onto the second part of my preview, enjoy. Will Power has proved himself one of the fastest and most consistent drivers in Indycar over the past five years. The Australian’s season has been up and down so far, with podiums teamed with missing the first race because of a practice crash, which caused concussion. He is now back to his best and starts sixth for the 500. With other rivals further down the field, Power is in a great position to fight for the victory all through the race. He has never won in the Indy 500, but with his skills and great pit work from Team Penske he may well find his 2016 turns around with a momentous victory in the centre piece 500. A win or even a top five finish would also really help kick start his potential title challenge after missing the first round. Takuma Sato has become a staple of the legendary A.J Foyt’s team, and this familiarity may breed a good result for the popular Japanese racer. Despite making a name for himself in F1, Sato has adjusted well to oval racing. He came very close to winning the 2012 Indy 500, and he may become a surprise contender once again come race day. So far his season has been uneventful, with two top six results his best after five rounds. He qualified twelfth for the 500, well ahead of his team mate. It seems Sato is most likely to lead the A.J Foyt team, and he can easily achieve a top ten or even top five result. Sato can be considered in the second group of contenders, ready to capitalize on any mistakes to ensure a good result. Graham Rahal surprised everyone in Indycar with his stellar 2015 season. Both Rahal and his team were underrated, and they proved everyone wrong with a title challenge which came very close to succeeding. This year it seems this combination was initially struggling to find it’s feet, although with two podiums in the past two races Rahal is seemingly hitting the right form going into the 500. It appears the team have been usurped as one of the top running Honda teams, with Rahal really struggling in qualifying. He will start from 26th and this leaves him a lot of work to do in the race. It also means he’s more likely to be caught up in accidents which could prematurely end his day. If Rahal can keep his nose clean expect him to rise up the field throughout the race, with a top five result surely a huge result for Rahal considering his lack of qualifying pace. Clearly the team have some work to do with the car, with time running out before the race. Rahal Letterman Lanigan have taken on reigning Indy Lights champion Spencer Pigot for a partial campaign this year, as he makes his debut in the Indy 500. So far Pigot has done his best to adjust to Indycar, with only two races experience going into the 500. With a rookie running a partial schedule it’s very difficult to come in and do well from the start, with so much to learn and not enough track time to do it. So far Pigot has stayed under the radar and got on with his programme, which is the perfect thing for a rookie to do. He starts 29th on the grid for the race, but he’s a talented young racer so will make up places. Finishing the race with a top 10 or 15 finish would be a good result for Pigot, as he continues to gain experience in Indycar. Conor Daly is another rookie looking to gain experience in Indycar, after a few years trying to climb the European single seater racing ladder. In his first full season Daly is another racer who is flying under the radar, although a sixth in the most recent round suggests Daly is improving with every race. The fact he is currently the second best rookie shows also his impressive switch to Indycar. He struggled slightly in qualifying, as he starts 24th for the 500. In the race gaining as much track time as possible will be important to Daly, with a top 15 finish surely a good result for Daly in his first Indy 500, against such a high quality field also. Don’t be at all surprised if Daly finishes as the best rookie in the race. Colombian Gabby Chaves is looking to maintain his Indycar career after an impressive rookie season last year. The 2014 Indy Lights champion showed plenty of pace and won the rookie of the year honour, but despite this he has not found a full season ride this year. After missing the opening rounds he’s been handed this lifeline by the Dale Coyne racing team, something he will surely want to turn into a good result. Coming into the biggest Indycar race of the year with a small team, having missed races is always a very difficult task. He starts 21st in the race and will be looking to turn this into a top ten finish. A big result could put him in the shop window for next year, but this will be very tough for Chaves. Should he pull it off he will surely be deserving of a full time Indycar drive next year. Ed Carpenter returns once again for another crack at the 500 with his own team, as he aims to finally turn the promise he’s shown into a good result. Carpenter always runs well on ovals, and this year should be no different. He’s only competed in one race so far this year, and this appeared to show as he qualified 20th for the 500. Carpenter always manages to be a thorn in the side of the much bigger teams, and watch for him to rise up the field into victory contention by the end of the race. A top five finish would be a good result for this small team, and would finally ensure a reward for Carpenter after years of near misses. Josef Newgarden has emerged as one of the best young racers in Indycar, having already secured a podium this year for the relatively small Ed Carpenter Racing team. The team have always performed well on ovals, especially Indianapolis. This is usually shown by team owner Ed Carpenter, but this year it appears Newgarden has usurped him for this honour. After a good start to the season Newgarden has carried this on by qualifying a very close second for this Sunday’s race, missing out on pole by only 0.060mph. Both car and driver are clearly performing well, and barring any dramas watch out for him as one of the outside contenders for victory. A win in the Indy 500 would be a surprise by well deserved honour for this young American. After a difficult first season with Team Penske, Simon Pagenaud is now taking Indycar by storm in his second year with the team. He has emerged as the dominant driver this year with three wins for five races, and will be aiming to make it four from six this Sunday. He has never been primarily known for his oval prowess, but with a solid eighth qualifying spot showing his car has pace here. Watch out for Pagenaud to rise to the front, with form from this season suggesting he is the man to beat going into the biggest race of the year. Sage Karam is a young driver looking to rebuild his reputation, after a difficult 2015 season. The young American clearly has pace, having won the Indy Lights title as a rookie in 2013. Since then he’s shown flashes of pace in Indycar, but has garnered a reputation as a reckless and sometimes dangerous driver. Despite having previous Chip Ganassi Racing support, this year he’s entering the 500 in a one off Dreyer & Reinbold entry. For a young driver in a one car, one off entry this is a very hard situation to produce a good result. He qualified 23rd and therefore will have the opportunity to rise through the field if he and the car are running well. He performs well on ovals so may be an outside bet for a top ten maybe top twelve finish, but for this entry gaining attention and support for further outings this year is the primary goal. That wraps up the second part of my preview for this weekend’s Indianapolis 500. I would like to say a huge thank you to Motorsport.com for the high quality photos which adorn this article, everyone should check out their website for the latest motorsport news. I would also like to thank you for reading this article, with any comments being greatly appreciated. Find me on Twitter @brfcjordan95. The last weekend of May is always a special weekend for motorsport fans. The most prestigious grand prix on the calendar takes place, the Monaco Grand Prix. Famous the world over it always provides excitement and celebrities flock to watch the on track action. Fans from across the world will be tuning in this weekend, eagerly anticipating the next stage of the Nico Rosberg vs Lewis Hamilton battle. After the champagne has been sprayed on Sunday, many motorsport fans will be switching their attentions stateside, as another of the motorsport triple crown takes place only hours after the action in Monte Carlo. The 100th Indianapolis 500 is something any self respecting motorsport fan will not want to miss, with furious high speed on track action guaranteed. The Indycar series has no where near the profile of F1, but in America the Indy 500 is still a major sporting event and will garner a further international audience. With speeds topping 225mph the action could not be more different to that in Monte Carlo. Both are equally considered races that form the triple crown of motorsport, the other being the Le Mans 24 Hours in several weeks time. Let’s take a look at the contenders in this years Indy 500. The reigning champion will want to add a third Indy 500 victory resume, and with Penske he has the perfect opportunity to achieve this. The most high profile name in the series has shown himself to be the front runner in the series for the past season and a half, despite narrowly missing out on the title at the final round last year. At 40 years old Montoya has lost none of his speed or hunger, which explains why he is such a formidable competitor for his rivals. Despite a good start to the season, Montoya suffered from a plastic bag getting stuck in his radiator on his qualifying run. After this bizarre problem ruined his qualifying he only managed to qualify 17th. The good thing for Montoya is that the race is 500 miles long, giving him plenty of time to move up the field and back into leading contention. With the knous of Team Penske behind him he will have a great chance to win a second consecutive and third overall Indy 500, ensuring he will be added to the list of Indycar greats. Despite qualifying Montoya is still arguably the favourite. The experienced Brazilian prepares for his 16th Indy 500, and is every bit as much a contender for victory as in his previous fifteen. The 41 year old knows the track arguably better than anyone else on the grid, and is in good form going into this Sunday centre piece race. With two podiums in the first five races he sits third in the points standings, and a win here from ninth on the grid would really give his title challenge serious momentum. Castroneves is another member of the four car Team Penske fleet, something that only enhances his bid for victory. He is a three winner of this event, although his last victory in the 500 came in 2009. With Castroneves in good form and the might of Team Penske behind him a fourth victory is very much possible for him. His competition will likely come from his team mates and rivals at Chip Ganassi and Andretti Autosport, but Castroneves could overcome them all if things fall his way on Sunday. Don’t be surprised if Castroneves is drinking the milk in winners circle come Sunday evening. Buddy Lazier returns this year with his annual effort with his family run Lazier Burns racing team. Whilst this is a small one car team with limited resources compared to the bigger teams, this team could spring a surprise come race day. The team struggled in qualifying with Lazier set to start 32nd, with a speed over 1mph down on anyone else. Whilst it doesn’t seem much, at Indianapolis this is a large difference. It also cannot be discounted the fact Lazier is one of six former winners in this race. Lazier was one of the original drivers in the Indycar series, winning the 1996 Indy 500 and 2000 Indycar series title. For the past ten years Lazier has focused on one-off entries in the Indy 500, and this will surely hamper him going into the race. Without the experience of the regular series drivers, this will only hamper his preparations for the race. For Lazier a top ten or top fifteen result will be a good effort for this small one car team. Canadian James Hinchcliffe provided a great pre-race story by claiming pole position, only a year after a huge accident here ended his season prematurely. Hinchcliffe has lost none of his speed and overcame the traditional big teams with his Schmidt Peterson motorsport entry. Sitting on pole position puts Hinchcliffe in the best possible position to secure a remarkable victory come Sunday. He definitely has the talent to do it and is coming into the race after scoring his first podium of the season in the Indianapolis road course race only a few weeks ago. To secure a Canadian victory in America’s premier motor race Hinchcliffe will have to put in a great drive, alongside fast pit work by his team. Both team and driver have the potential to win, they just need to execute under pressure, which is a lot easier said then done. JR Hildebrand returns yet again to Indianapolis with a one-off entry with Ed Carpenter racing, after racing with CFH Racing last year. Both Hildebrand and Carpenter perform well on ovals and the team have shown the potential to score a great result in the 500. Whilst he’s likely known for his last corner crash in his debut Indy 500 five years ago, the fact he was a few hundred meters away from winning his debut 500 shows how well he can run here. Despite being inexperienced compared to his full season rivals, Hildebrand has two top ten finishes from the past two years. This is a huge achievement for a one-off entry with a smaller team. He lines up fifteenth on the grid, but during the race Hildebrand could very well improve from a top ten to top five finish. Mikhail Aleshin has returned to Indycar this year, after switching to sportscar racing last year with SMP Racing. The talented Russian’s season has been solid so far, with a top five finish in the opening round showing his potential once again. Whilst he’s a European convert Indycar racing, qualifying seventh for the 500 shows Aleshin can become a good oval racer. The Schmidt Peterson team have produced good cars for Aleshin and team mate James Hinchcliffe, with both capable of shocking the major teams with a podium or victory this Sunday. Whilst Aleshin does not have a wealth of experience in Indycar, he has enough to produce a great result in the 500 with his talent. Watch out for Aleshin as an outside bet for a top five, although even a top ten would be a good result for the Russian and his team. Max Chilton prepares for his debut Indy 500, as he still adjusts to the Indycar series and it’s ovals in his rookie season. Despite some limited experience in the Indy Lights series last year, the former F1 racer is doing well adjusting to the series. With his F1 experience a lot of people may expect him to immediately come in and be competitive, but that’s not realistic. Whilst his results so far have not been spectacular, he is improving with every race and the Indy 500 will only accelerate this. He’s qualified a respectable 22nd on the grid, and he will likely improve as the race goes on. With the collective might of Chip Ganassi Racing supporting him, he could not be in a better place to become a very good Indycar driver with the likes of Dario Franchitti helping him. For Chilton a top fifteen finish would be a very good result for him, although simply finishing the race will only further his experience with the car and ovals in general. The mild mannered Kiwi Scott Dixon arguably rivals Juan Pablo Montoya as the current series benchmark, with Dixon being the reigning series champion only enhancing this viewpoint. He won on the series only oval round so far in Phoenix, and sits pretty in second as he looks to win back to back titles. He’s a four time champion and the winningest driver in the field, although he has only managed one Indy 500 win in 2008. He starts out of position in thirteenth, but expect him to quickly rise through the field like the driver his livery emulates, legend Alex Zanardi. Discount Dixon at your peril, as he always manages to produce good results from nowhere, and this Sunday may be the latest example of this. Another former winner amongst the Ganassi stable of entries is Brazilian Tony Kanaan, who has so far had an average start to his season. He was always the hard luck story before he won the 2013 Indy 500, with his old luck returning since. With two successive 26th finishes in 2014 and 2015, it will be hard for Kanaan to do any worse this year. The 41 year old qualified eighteenth this year, and will surely move up the grid once the green flag is dropped. Whilst he’s always suffered from bad luck at this circuit, he always runs well here and teamed with Ganassi he has the perfect package to win or even finish in the top five. Either would be a great result for Kanaan and would really kick start his season. Sebastien Bourdais is well versed in the American Indycar scene, having made a name for himself stateside over the past decade. The Frenchman’s best finish in the Indy 500 is seventh in 2014, although he has plenty of Champ Car titles and wins to cement his reputation as a very quick Indycar driver. It’s been a tough start to the year for Bourdais and his KVSH team, with a best finish so far of eighth in the opening five rounds. Qualifying for the 500 didn’t change his luck, as he posted the nineteenth fastest average speed. Despite a bad start to the season Bourdais is the kind of driver you can never discount, as he could spring a surprise and produce a great result from nowhere. He will need his KVSH team to produce slick pitstops if he wants a good result, but certainly don’t discount the experienced Frenchman. That wraps up part one of my Indy 500 preview. I would urge everyone to visit Motorsport.com for the latest news and high quality photos, some of which have been used in this article. Part 2 will be coming in the next few days and finally, thank you for reading. Find me on Twitter @brfcjordan95. After looking at the main Prototype class yesterday Here , now it’s time to turn our attentions to the Prototype Challenge class. The opening Rolex 24 produced a surprise winner in the #85 JDC/Miller entry, after problems with the favourite #54 and #52 entries. This time around, will the normal order be restored or will Sebring spring another surprise winner? The two Starworks entries suffered with costly accidents at the Rolex 24, although the progress this #8 car made in the second half of the race showed that if they had not got involved in various scrapes they would of been a strong contender for victory. This time out at Sebring the team will be looking to translate their pace and skill as a team into a podium placing. They have one of the best driver line up’s in this class and the Starworks team are stalwarts at this top level of US Sportscar racing. This entry has to go into the race as one of the favourites for class victory. The #20 BAR1 entry was another PC tale of disappointment, as the class pole sitters hoped for victory in the centre piece race, but had to be content with a distant third. Whilst this would have initially seemed frustrating, it was still a decent points haul for this team as their rivals struggled. The team will be hoping to achieve another podium placing this weekend in the sunshine state, and they have a solid experienced line up of drivers who can get the job done for this BAR1 team. Another points haul for their championship would be a good result, and they will be slight outsiders for a class victory. The #38 team were yet another PC team who struggled on the high banks of Daytona, as they eventually were forced out of the Rolex 24 thanks to reliability issues. The team will not let that dampen their progress however as they look to bounce back for round two this weekend. The team is one of the smaller outfits in the class, but they have proved in the past they can mix it with the bigger and more prestigious teams within this class. The driver line up is a another solid one at this level, and this team may well sneak a podium place if the attrition rate matches what we say in Daytona. Do not discount this entry as an afterthought in this class. The #52 PR1/Mathiasen entry was one that recovered from adversity to eventually finish second, only four laps down on the class winner at the Rolex 24. The team have a knack of attaining victories in the key long distance races and this team actually won the Tequila Patron North American Endurance Cup last year. This is a mini-series made up of the four longer distance races on the calendar. Second gave the team a great points haul, especially as their primary rivals such as the #54 entry retired early on. The team will be hoping they can repeat their victory at this race last year, as this would put the team in a very good championship position after the early rounds of the WeatherTech series. This PR1/Mathiasen entry has the perfect blend of youth and experience behind the wheel, so watch out for this car to fly with all three drivers at the wheel. The Rolex 24 at Daytona was a disaster for this usually dominant CORE Autosport team. The class champions from the past few years suffered an early engine failure which put them out. Now have some ground to make up on their rivals in the championship also, something they will look to do with a class victory this weekend. The team and driver line up is the best in this PC class, and will be looking to reassert their dominance at the bumpy airfield of a Sebring circuit. The #54 will be one of if not the ultimate favourite for the PC class victory come Saturday night. The Rolex 24 was an almost perfect race for the JDC/Miller Motorsport race as they claimed the class victory by four laps over the #52 PR1 entry. Whilst the team had some scrapes in the race, they were the most reliable car which gave them the victory. This team is another of the smaller outfits in the class, and their class win was a great story in Daytona, but can they do it again this weekend? All four drivers demonstrated their talents in Daytona, especially Stephen Simpson, so can they reproduce this at another sportscar classic run in Florida. This team showed on pace they can match anyone else in this class, so can they topple the bigger teams once again? It’s difficult to see but after Daytona anything is possible for this JDC/Miller team. The second of the Starworks entries is another high quality addition to this class for this years Sebring 12 Hours. The team are locally based in Florida therefore will feel confident going into this race. Whilst this car was out early on in Daytona, they will be another team hoping to bounce right back with a great result at Sebring. The driver line up is yet another very strong one, and the team will have more than enough talent to grab the class victory, although a class podium and a good haul of points of the championship would also be a success for this team. This #88 car is a strong contender for class honours this weekend. That wraps up my look at the seven car Prototype Challenge Class for this weekend’s Sebring 12 Hours, soon I will be posting my preview of the ultra competitive GTLM class. I would like to say a huge thank you once again to IMSA.com and Motorsport.com for their information and high quality pictures that grace this article. I would also like to say a final thank you for reading this and any comments below would be greatly appreciated. Find me on Twitter @brfcjordan95. 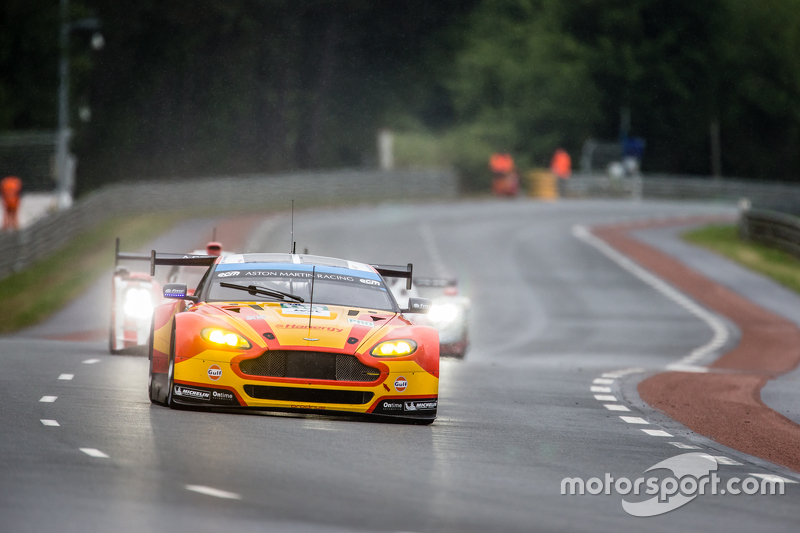 After part 1 previewing the GTE Pro class at this year’s Le Mans 24 Hours, part 2 looks at the remaining contenders in this fiercely competitive GTE Pro class. With four manufactures and their hord of professional factory drivers set to compete flat out for 24 Hours, their battle for class victory will be scintillating to watch throughout the race. #92 Porsche Team Manthey Porsche 911 991 RSR: Patrick Pilet/Frederic Makowiecki/Wolf Henzler The second Porsche Team Manthey entry is much like every other GTE Pro car in that it has a great chance at a class victory, with a top line Porsche factory team and a full line up of factory drivers in this car. This entry has been fighting with Aston Martin and Ferrari all season so far in the World Endurance Championship, and will be looking to continue this fight at Le Mans. On the driving front this entry has one of the best GT drivers in the world in Frenchman Frederic Makowiecki. Partnering him are long time Porsche factory drivers Patrick Pilet and Wolf Henzler, with all three highly professional drivers who will be delivering consistently quick stints throughout the race. The all-Danish “Dane train” Aston Martin which dominated the GTE Am class last year, has this year stepped up to the cut and thrust of the GTE Pro field. 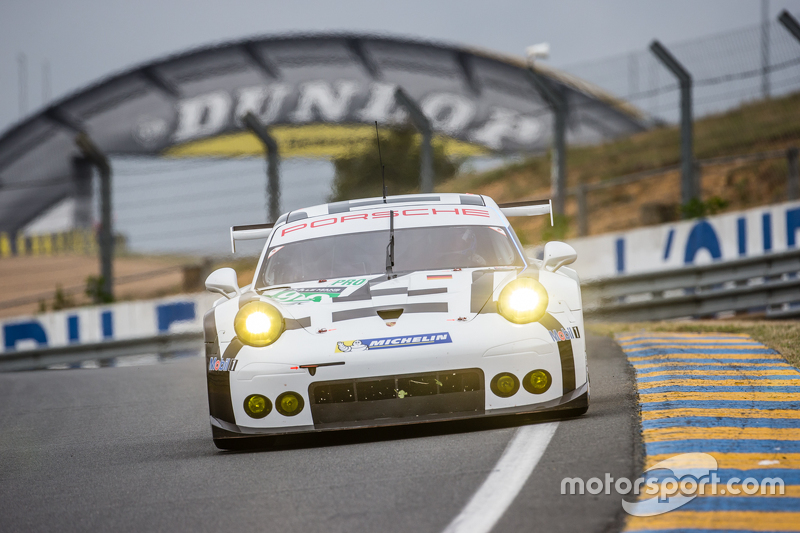 So far the team has shown it can handle the step up, with solid top six placings in the opening two WEC rounds. Nicki Thiim is the only driver who remains from the Danish trio from last year, with new team mates Marco Sorensen and Christoffer Nygaard for this year. Nygaard has moved across from the sister #98 entry for this year, with the young Dane and GP2 racer Marco Sorensen completing the line up. Thiim and Nygaard will provide good pace and experience behind the wheel, with the young charger Sorensen balancing his GP2 season with a switch to GT racing. All three will be looking to impress at Le Mans, although in this hugely competitive class, it may be difficult for this team to move up to GTE Pro and win Le Mans in their first year. A class podium would be a great result for the “Dane Train 2.0”. 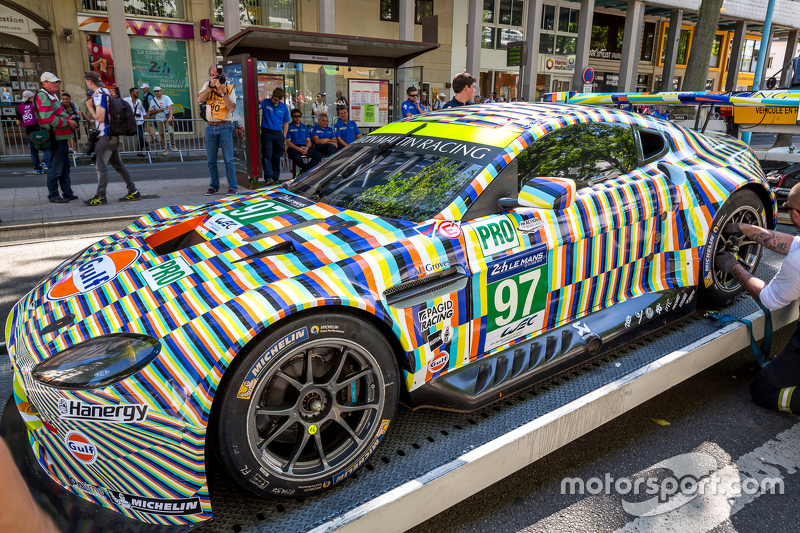 This number 97 Aston Martin will be the one that stands out throughout the race week, as this car will have a very distinctive ‘art car’ livery by artists Tobias Rehberger. As well as standing out for it’s art car livery, it will also stand out as this car will likely be the one that leads the Aston Martin charge for class victory in the race. The Aston Martin team are regulars now in the highest level of GT racing, and have come very close to winning the GTE Pro class the past two years. This year the team will be aiming for a class victory, and this car is the one most likely to deliver it. Experience is the name of the game with this driver line up, with Darren Turner, Stefan Mucke and Rob Bell all being long term factory drivers for Aston Martin. Their speed and experience will be a potent combination in the race, and if the team can avoid misfortune this car will be fighting for victory going into the final hours of the race for sure. 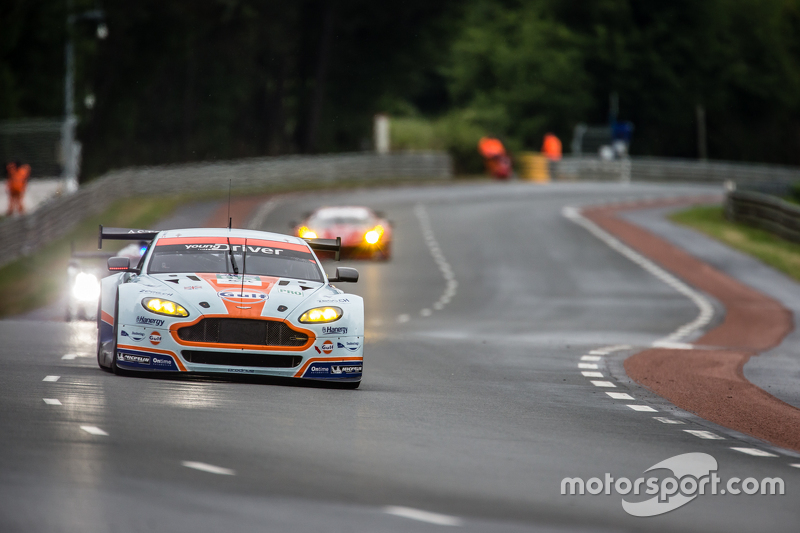 The third and final works Aston Martin racing entry at Le Mans is the Number 99 car, which goes into the 24 hours on great form after taking the class win at the most recent WEC round at Spa a month ago. This car is very much in the hunt for the WEC drivers title after two rounds, and with Le Mans being a double points round this weekend will have a big outcome on the championship. Both Fernando Rees and Alex MacDowall will be hoping for much better luck this year, after a huge practice crash for Rees last year forced the team to withdraw from the race on the opening day of running. This year they both have a new team mate in young New Zealand hotshot Richie Stanaway. He has shown well in GP3 and especially GP2 this season, and his fresh injection of pace will only add further strength to this car’s chances of a class win. If all three drivers have a close to perfect race, their talent and this Aston Martin Vantage will have more than enough pace to take an unexpected GTE Pro class win, although if the car suffers any misfortune in the race it will be difficult to see them being able recover enough to claim the victory. A podium will be a very good result for this team, although a class win is a definite possibility. That wraps up my look at a very competitive GTE Pro class, hope you enjoy this article and any comments would be appreciate both good and bad. I have to add thanks to Motorsport.com for their amazing, high quality photos which you see in this article. I urge you to go and visit their website http://www.Motorsport.com for all the latest news and photos from the motorsport world. Next up will be a preview of the LMP2 class.